This is the basic kit that is at the heart of the Ultimate3S QRSS/WSPR transmitter kit, the VFO/Signal Generator kit, and the Clock kit. This "QRP Labs Control Unit" kit can be used in case it is necessary to replace a damaged main board etc. The kit incudes the 16 x 2 LCD module, 20MHz crystal, BS170 transistor, buttons, resistors, capacitors, hardware and all connectors (4-way sockets, 10-way sockets, 16-way plug/socket for LCD) that are used in the Ultimate3S kit. 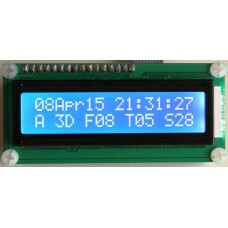 This kit does NOT include firmware, any plug-in module kits (except the LCD which IS included), or the FT37-43 toroid. These can all be purchased separately in this shop if needed.